We had a great vacation! Today was probably my best skiing day! All week I kept looking at the top of the mountain and thinking that I could probably ski it, if I could just get up there. I was really afraid because they don’t use normal lifts to get you up there. They use t-bars. 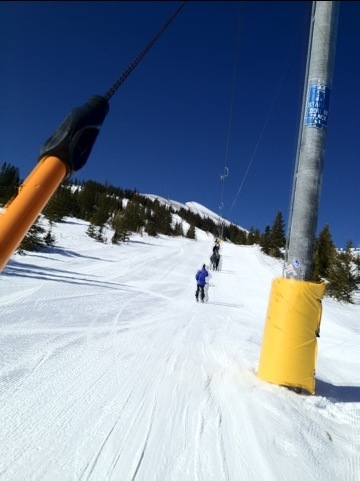 I’ve never been on a t-bar and watching everyone go up the mountain on them made it seem really scary. My first attempt to get on the t-bar was not successful. I watched Mike fall to the ground as he got on, so I was really nervous. I got a little further but somehow I ended up holding the bar with my hands. I could hear the guy that loads us tell Mike I wasn’t going to make it. I was determined to hold on until I saw how far I would have to hang on, so I let loose and had to ski back down and try again. Mike saw me and got off and we rode up there together. I was right! I had no problem skiing down this run even though it was a black. Mike had no problem either, until he got to the bottom crossing area. 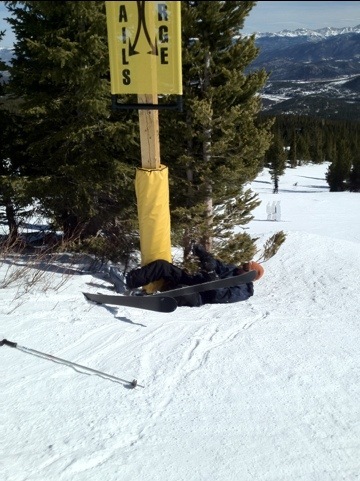 He skied over his pole and ended up in the be careful sign. Luckily, he wasn’t hurt!! I hate T-bars. I’ve done them though. I’d rather sit and know the chair is going to get me there. I absolutely LOVE the picture of Mike wiped out, HA HA HA!